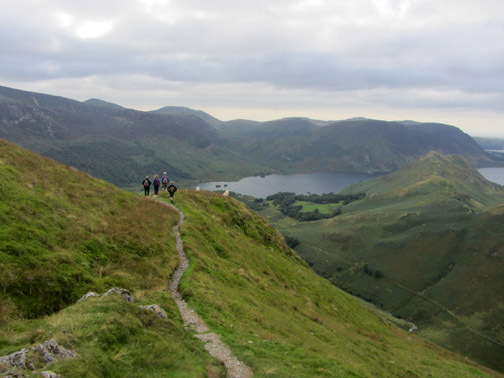 " Dale Head to Buttermere"
Date & start time: Wednesday 28th August 2013, 12.30 pm start. 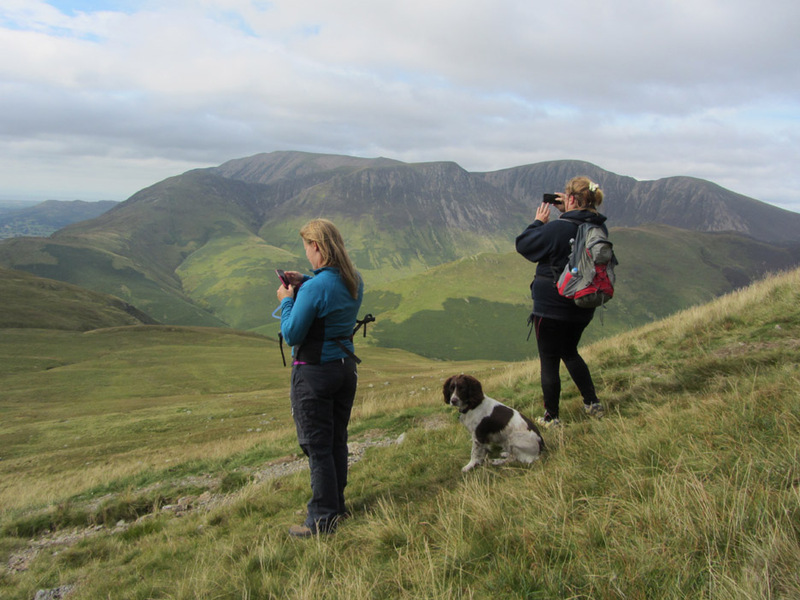 Places visited : Dale Head, Hindscarth, Robinson, Buttermere Moss, Buttermere. 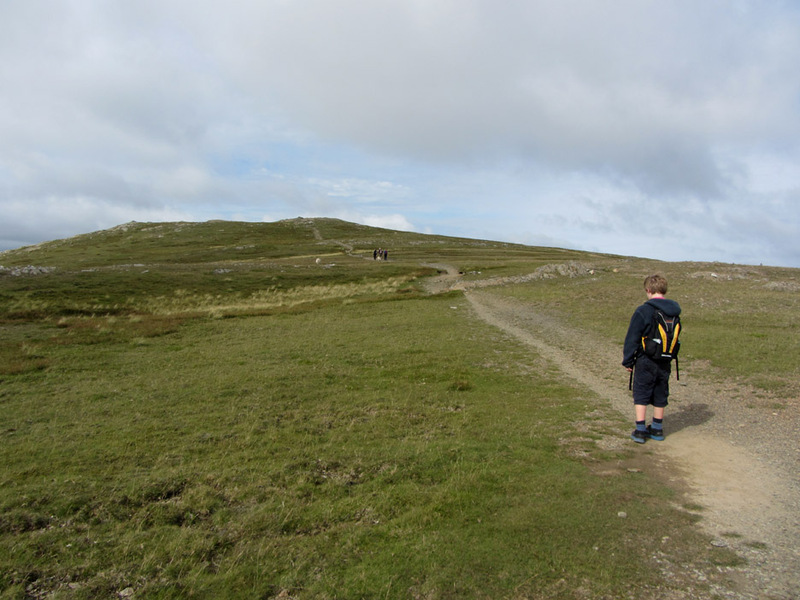 Walk details : 5.9 mls, 2150 ft of ascent, 2950 ft of descent, 4 hours 55 mins. 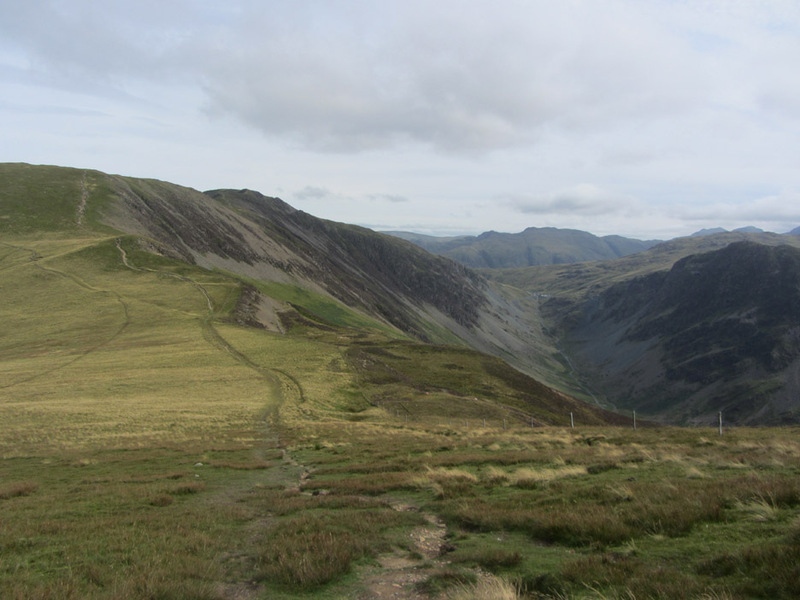 Highest point : Dale Head 2,473ft - 753m. 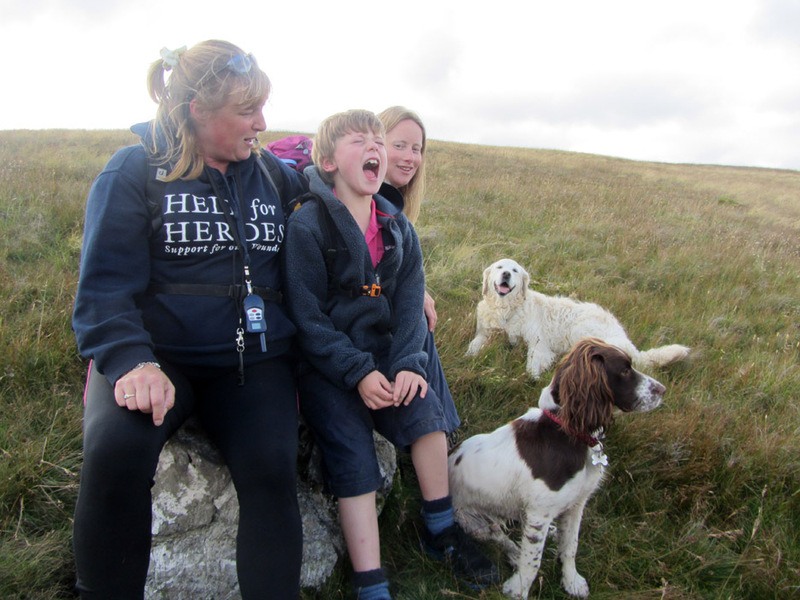 Walked with : Cathy, Jen, Alexander, Ann and the dogs, Boris, Harry and Bethan. Weather : High cloud obscuring the sun but an otherwise bright and warm day. 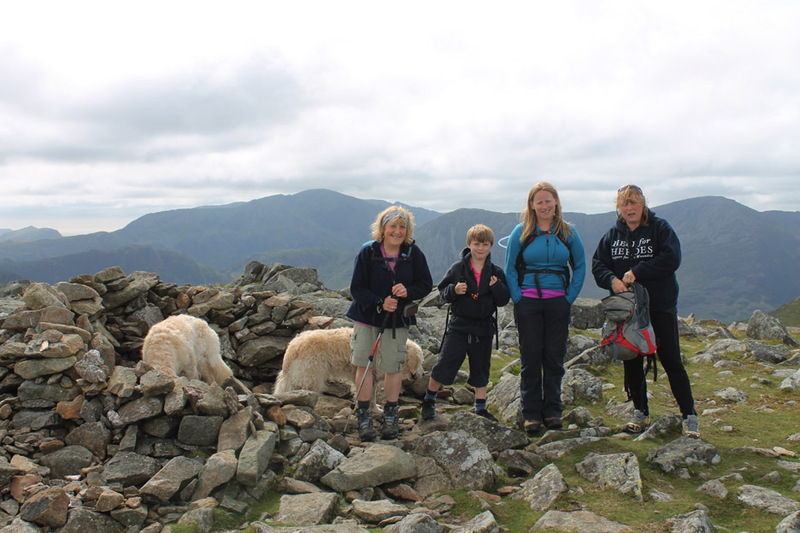 Three summits today in a relatively straight forward sequence. Leaving one car at Buttermere for the return leg, we drove to Honister to start the climb to the first summit, Dale Head. 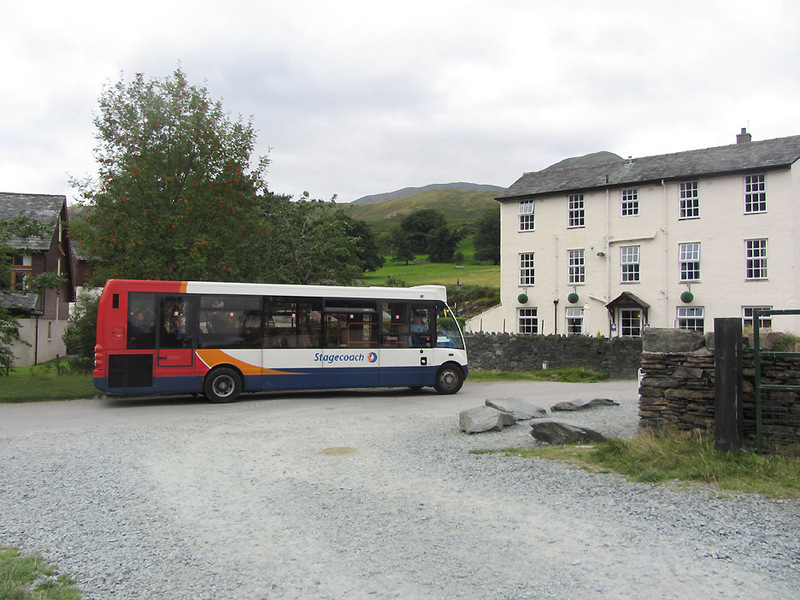 At the end I gained a bonus point for using my bus pass instead of using the 2nd car to return to Honister. Consequently the others were able to enjoy a little gentle re-hydration while awaiting my return. 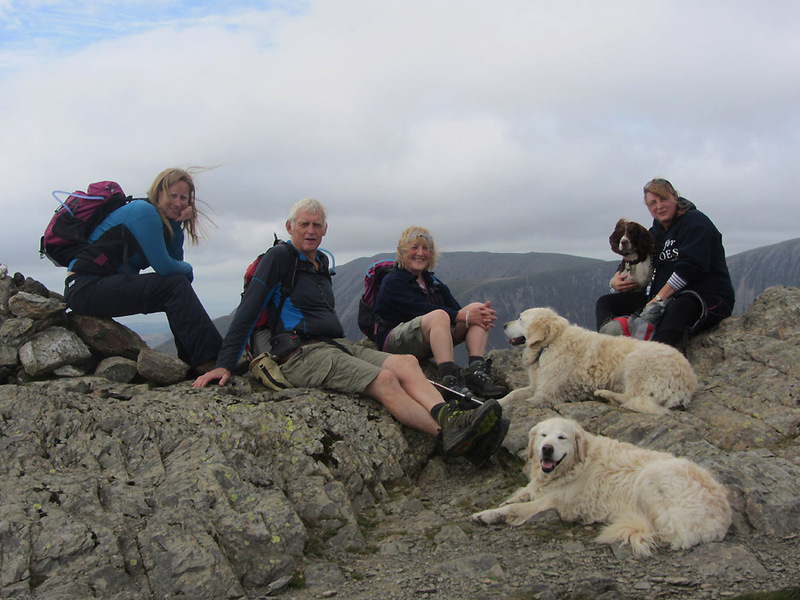 The Dale Head team . . . Boris, Cathy, Ann, Alexander and Jenna. First climb your mountain . 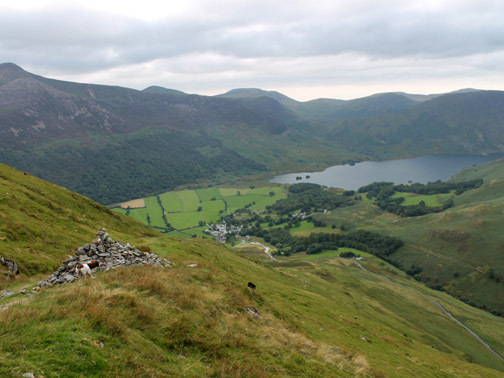 . .
is highlighted by the shape of the spoil heap here on the Yew Crag side of the valley. 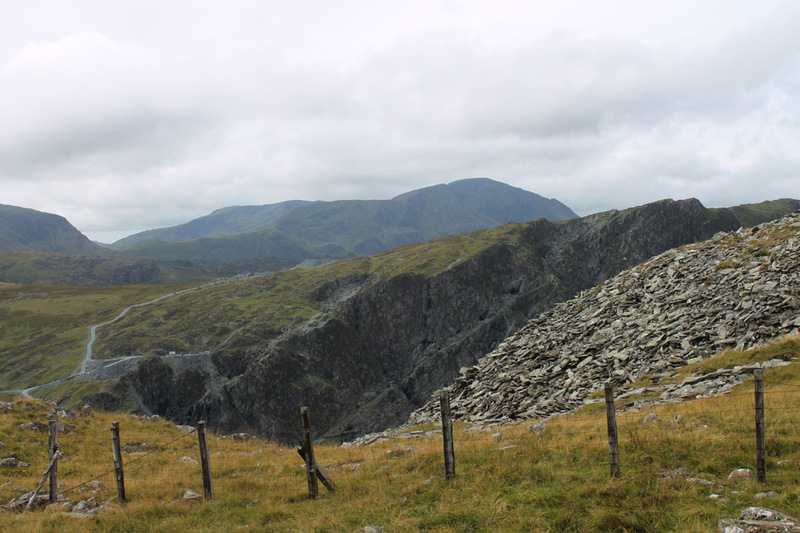 Each of the dark holes on the rock face opposite is an addit leading into another section of the Honister Mine. In seemed no time at all . 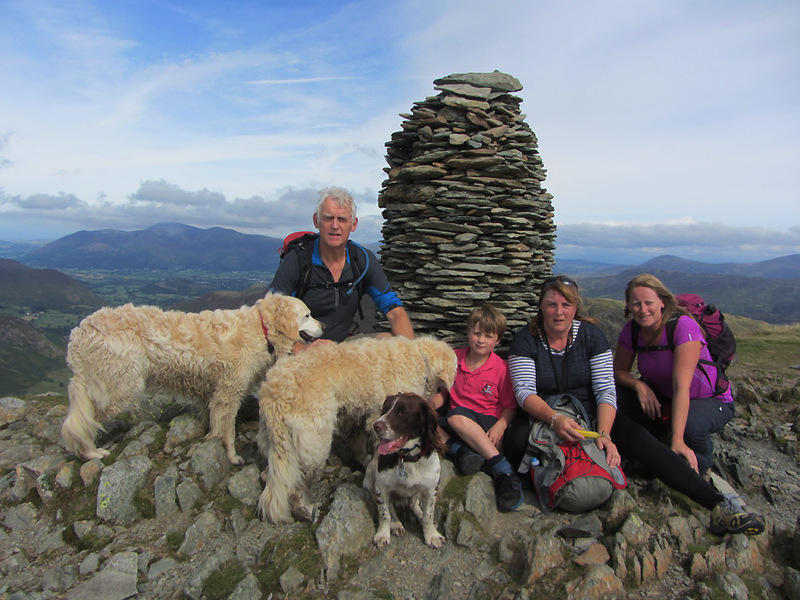 . . but today in about 55 minutes we reach the summit. 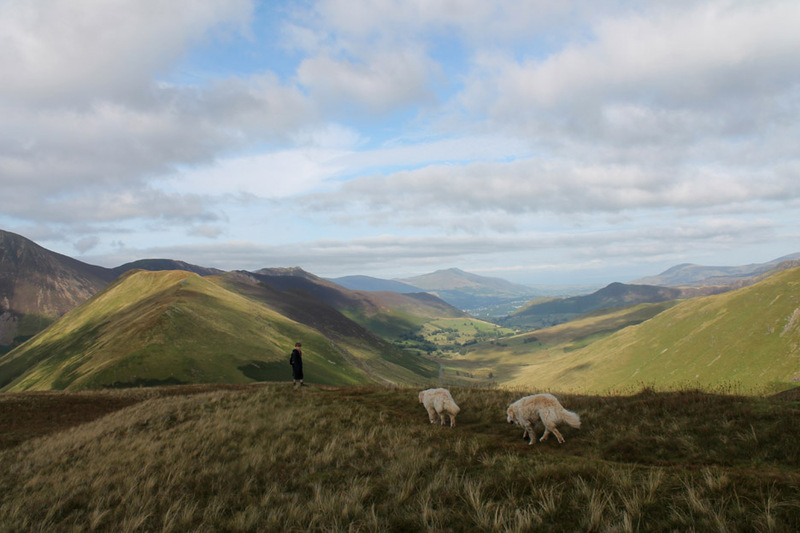 The classic view of the Newlands Valley in wide-screen . . . with Bethan adding perspective. 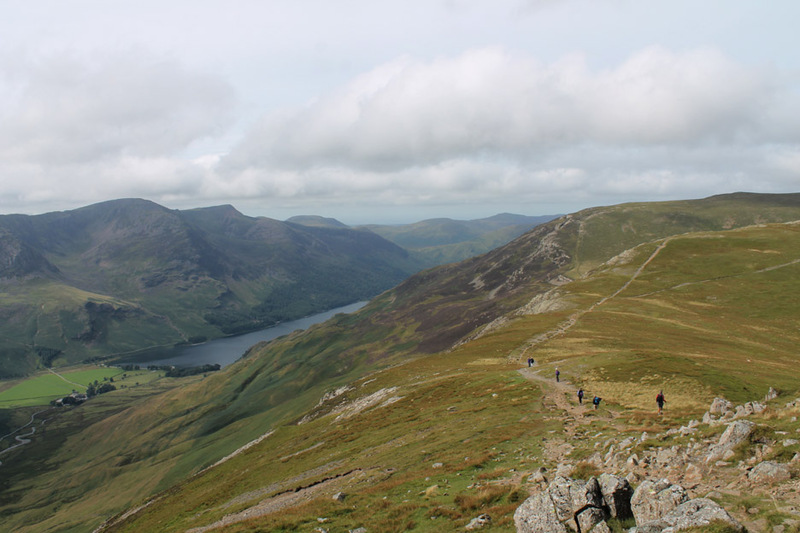 Our high level route took us around Hindscarth Edge where we regained our view of Buttermere. Navigation is easy . . . follow the track and keep the steeper side on the left. 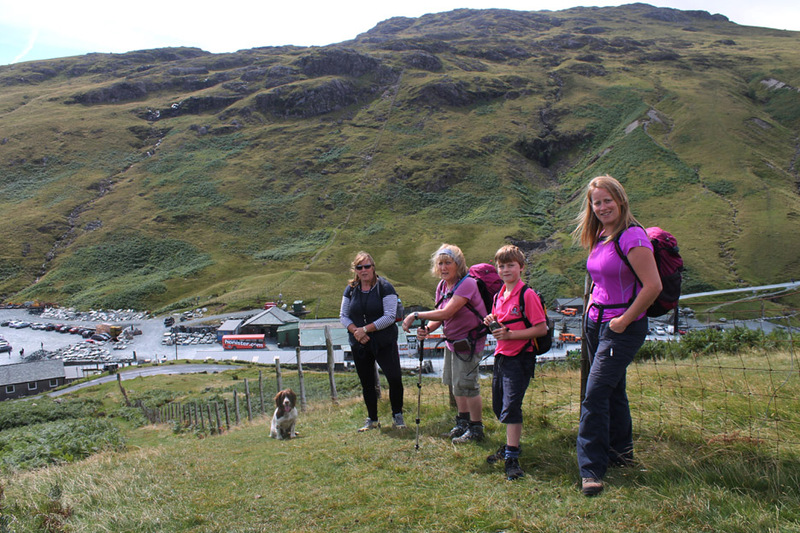 Ann and the girls start the gradual ascent onto Hindscarth. 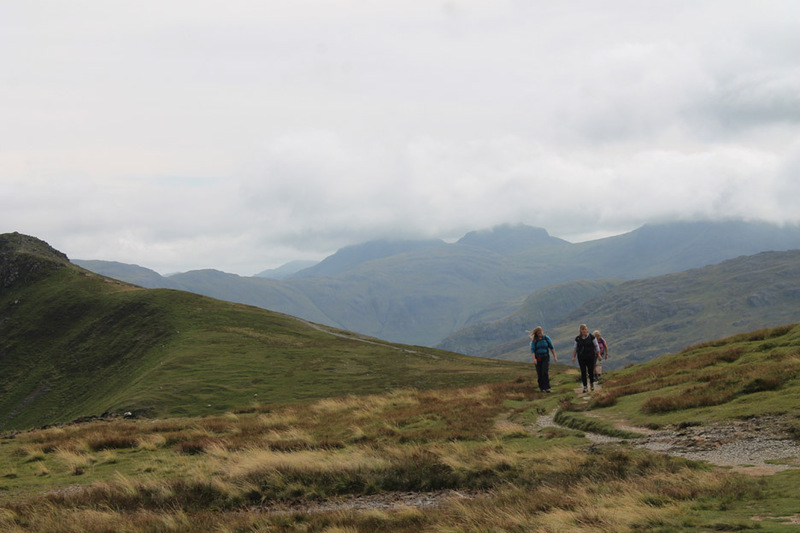 Behind, the cloud is just touching the high fells but it is not affecting our walk at all. 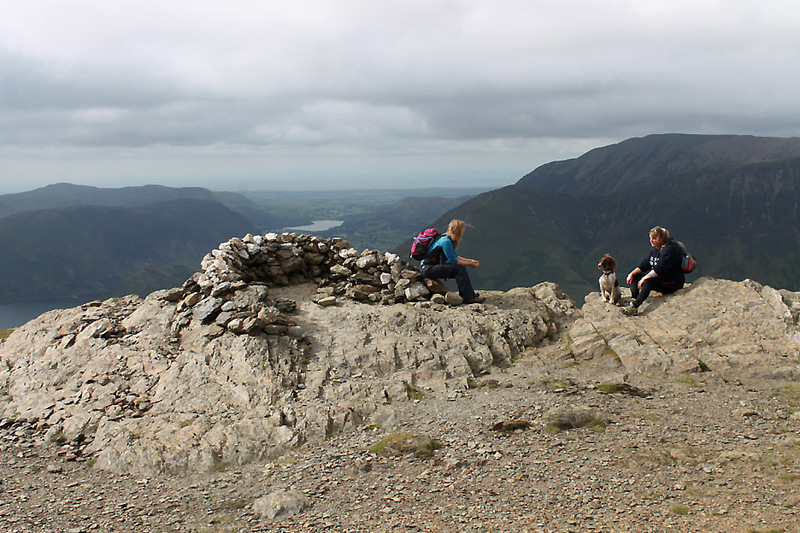 Summit number two . . . Hindscarth. A small shelter would offer respite from the prevailing wind but we don't need it today. 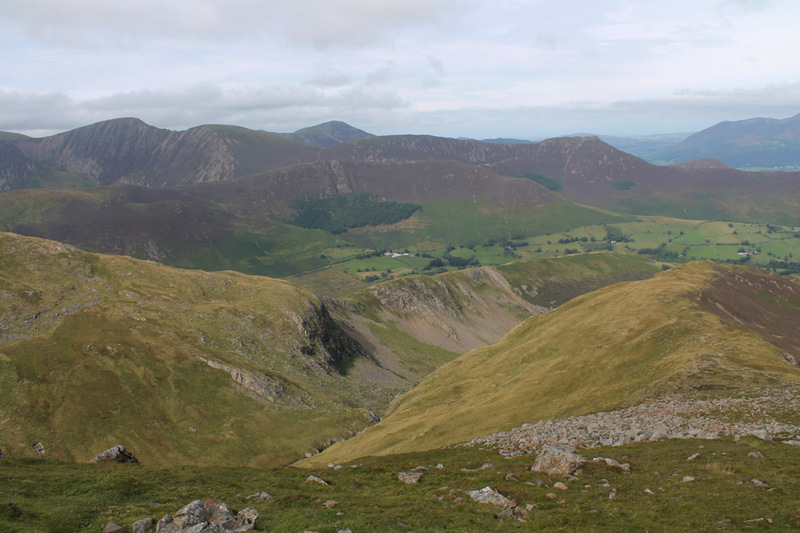 Hindscarth has an attractive northern ridge with the Little Dale valley down to the left. Hindscarth plateau slopes north to a second stone shelter so we extend the walk slightly in that direction. An extensive stone shelter, again built facing east to offer respite from the prevailing westerly winds. In the winter months when the wind turns, some shelter can be found behind the tall back wall. 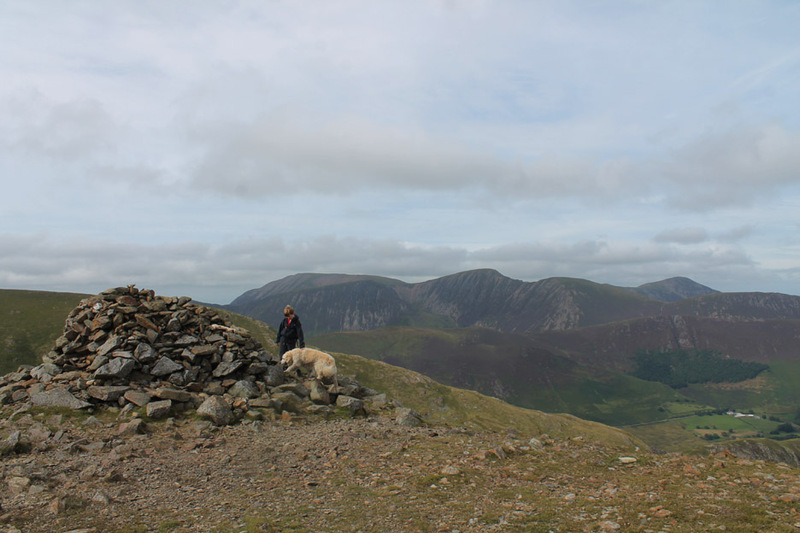 The shelter cairn has a commanding view down over Scope End (with the old gold mines) and over to Catbells and Keswick. There's good visibility today and we can see through to the Pennines . . . though it is looking slightly cloudy over there. 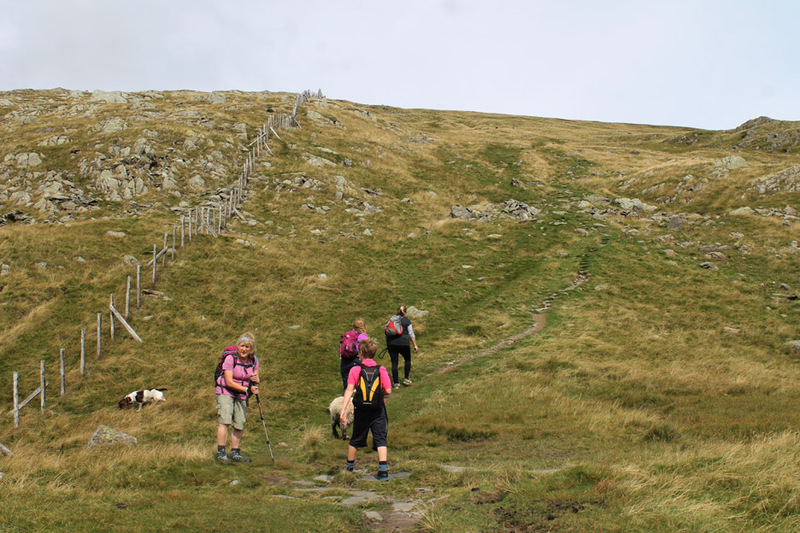 Back up to the main summit . 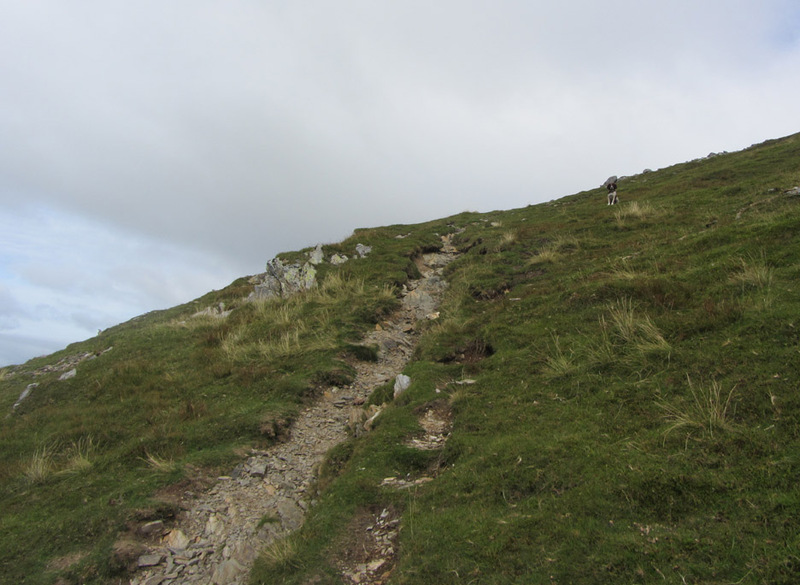 . .
it seems a lot steeper on the way back up than it did going down to the cairn a few minutes earlier. We do the second westerly loop of the day . 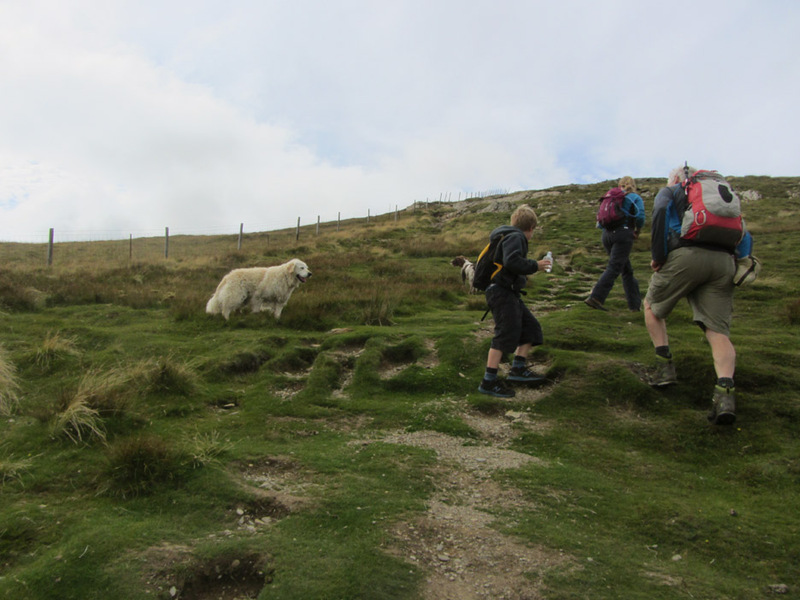 . . heading around Littledale Edge this time. 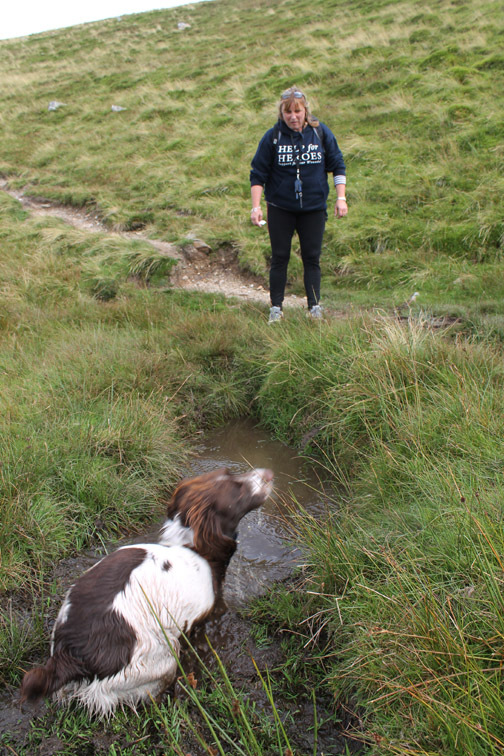 Alongside the path there's a muddy puddle caused by the spring water. Technically it would be nice and clean but it has a magnetic attraction to dogs . . . especially in warm weather. Boris thinks cooling off would be great . . .
. . . and rushes to tell Cathy how good it was ! 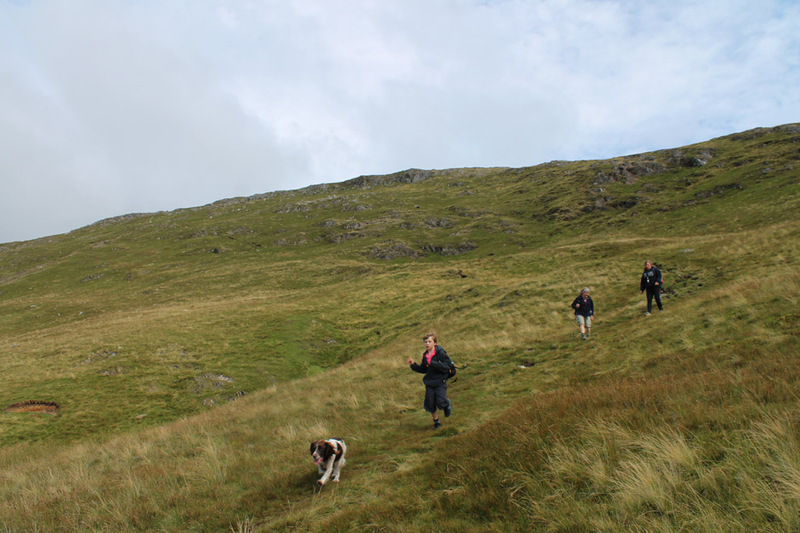 and up now towards Robinson Fell top. 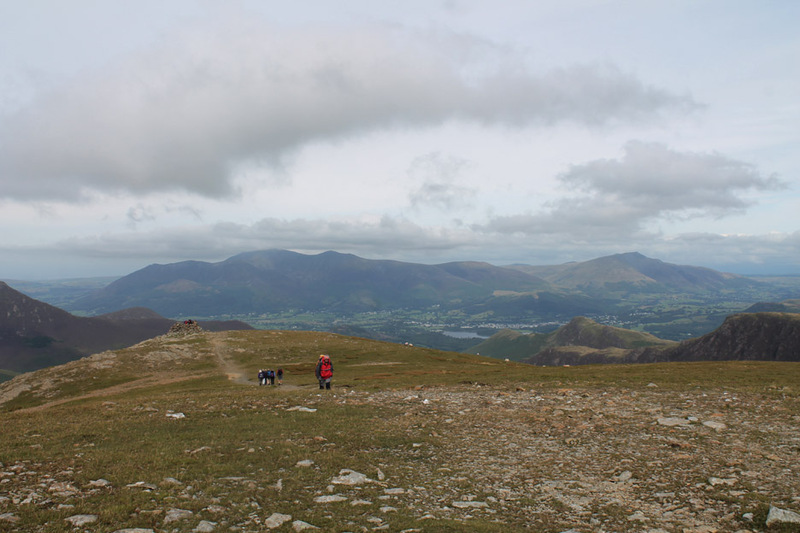 The third summit and the third climb of the day. The broad top of Robinson . . . Alexander walks with Ann along the path. 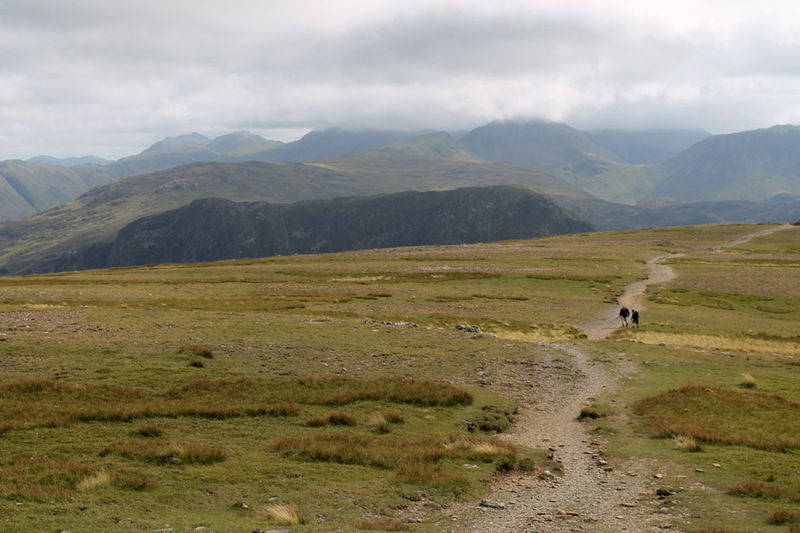 In reverse mode, I look back to see them walking the final hundred yards to the top. Jenna, Boris and Cathy are already sitting by Robinson summit shelter. There's an extensive view from up here . . . check it out . . .
Alexander's turn to work the camera . . . didn't he do well ! 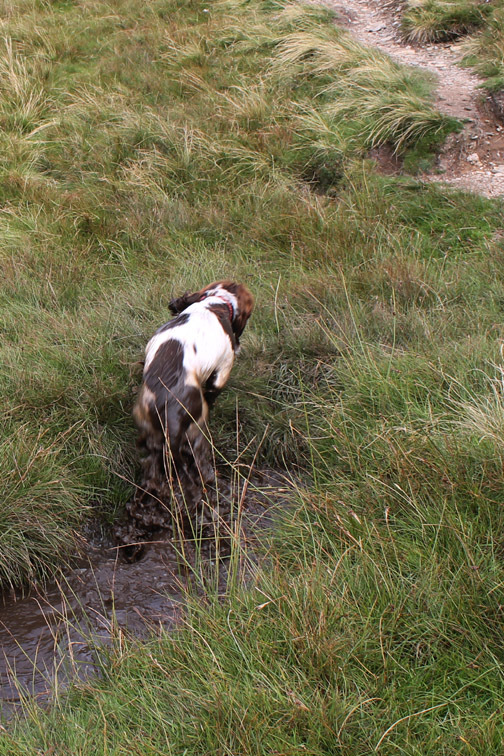 Job done, he scampers off down the fell. 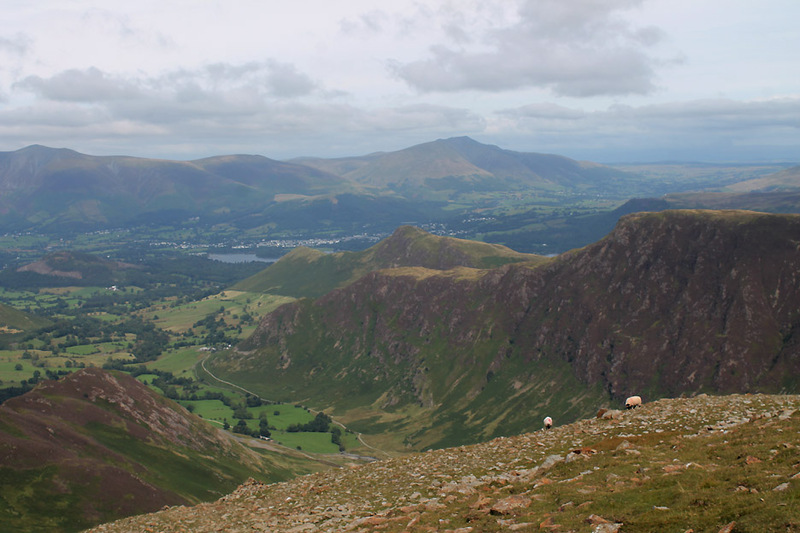 Great views of Buttermere and Rannerdale from up here . . . so the girls stop to record the moment. Boris waits patiently for his chance to be off and away. In view of his slightly muddy misdemeanor, Cathy tried a little obedience practice . . .
and he was really good at sitting quietly until called. Passed with flying colours . . . he flew off down the fell . . . closely followed by Alexander. 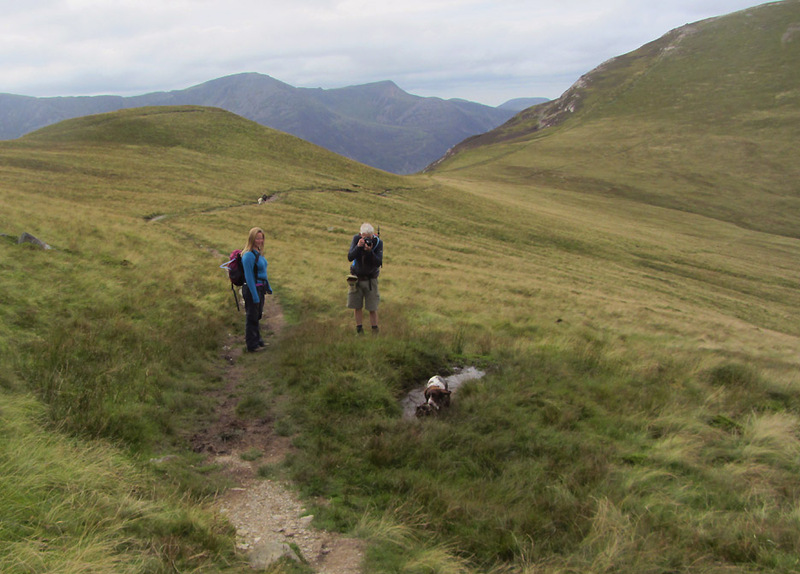 Heading out into Buttermere Moss. 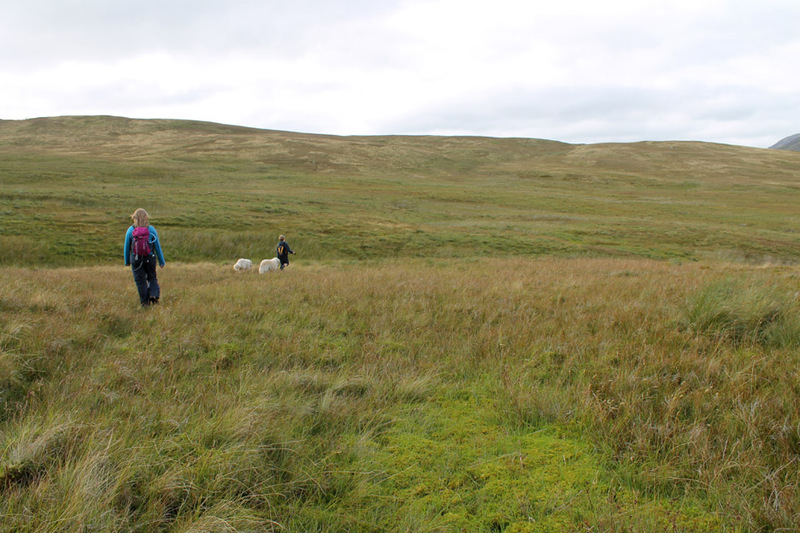 In view of the recent dry weather we took the direct line across the flat, upland plateau. Aim for the brown moorland grasses . . . anything brightly coloured means dampness underfoot. 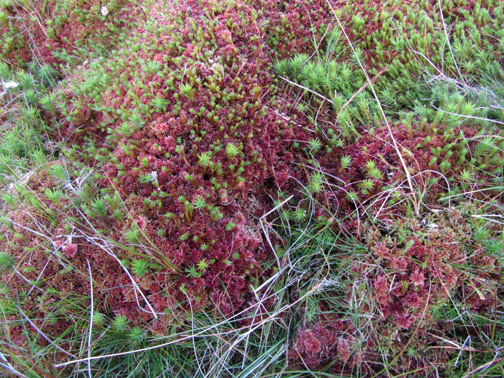 On the way across there's a fine display . . .
. . . of colourful sphagnum moss. Alexander complained that he had to give his seat up for his elders. He started to complain but no one made room. He looks upset doesn't he . . . NOT ! 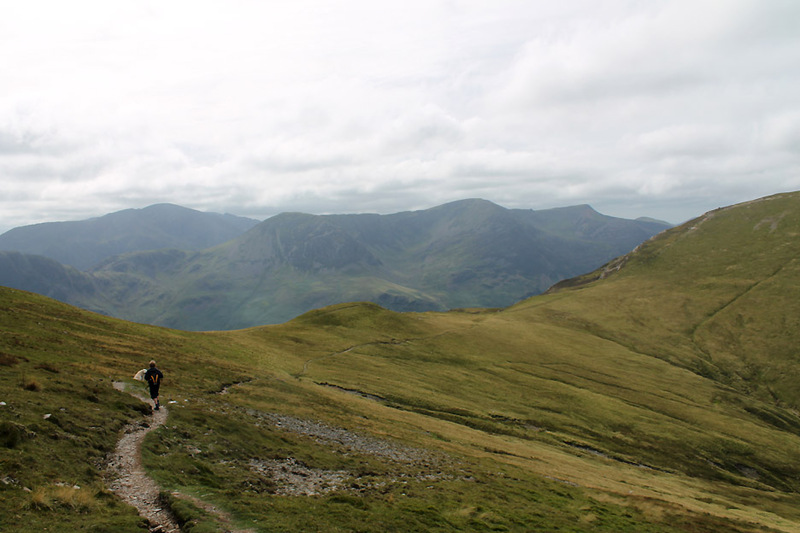 The upper Newlands Valley leads the eye across to Blencathra this time. 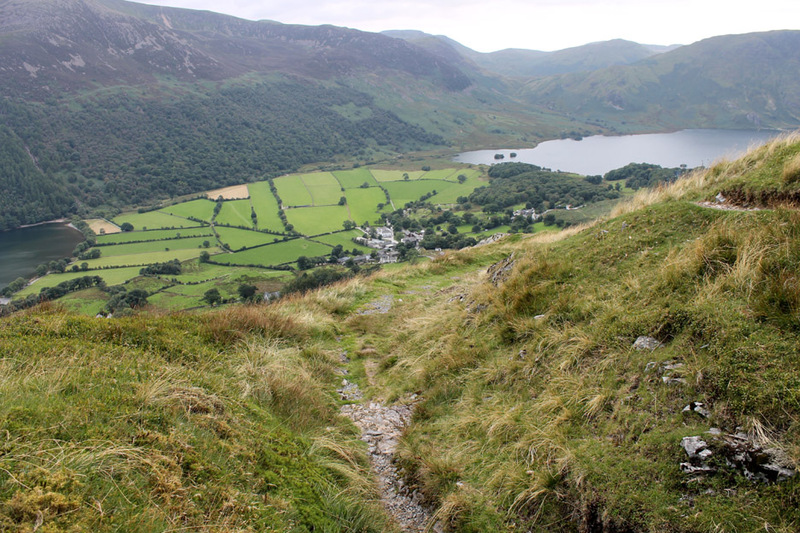 We have crossed the Moss and need to find the path down to Buttermere. Crossing lower than usual we missed the start . . .
. . . but now we're safely on the way down. 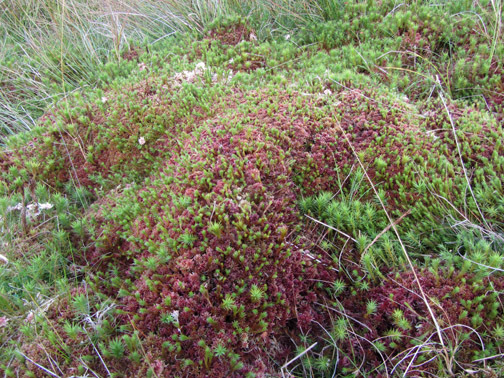 which the locals would have used to bring peat down from the Moss above. It would be burnt as fuel in the winter. 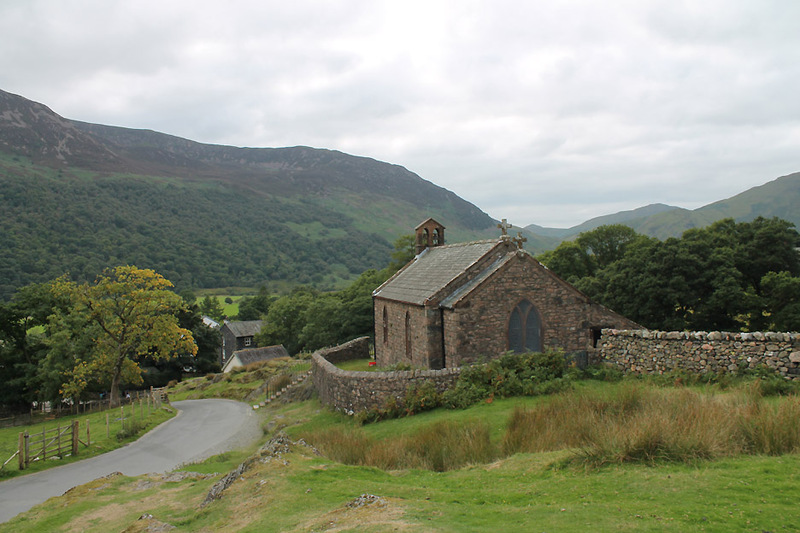 The smallest of the three churches of the Loweswater area. Our walk ended here at the church which is where we had parked our first car. as Cathy and I drove back up the valley to fetch the first car. 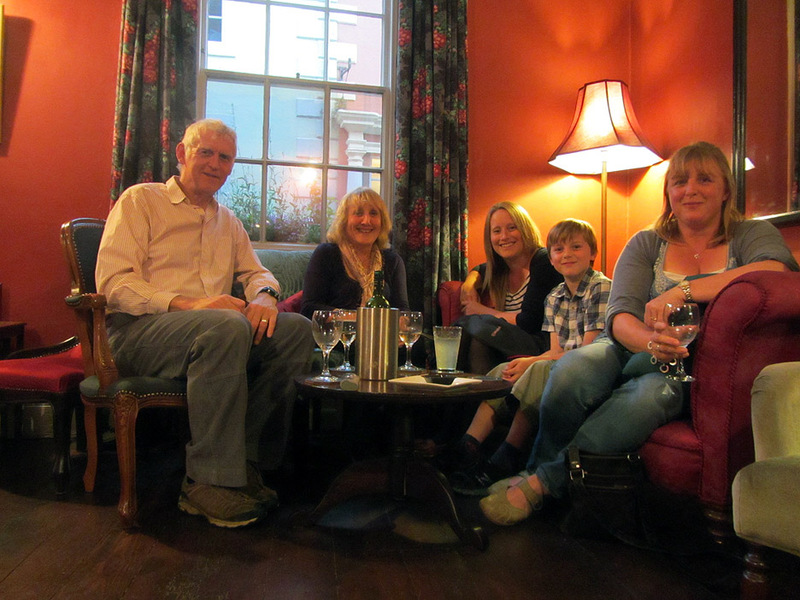 Unfortunately both cafes in the village had closed at 5pm so we opted for the Bridge Inn. 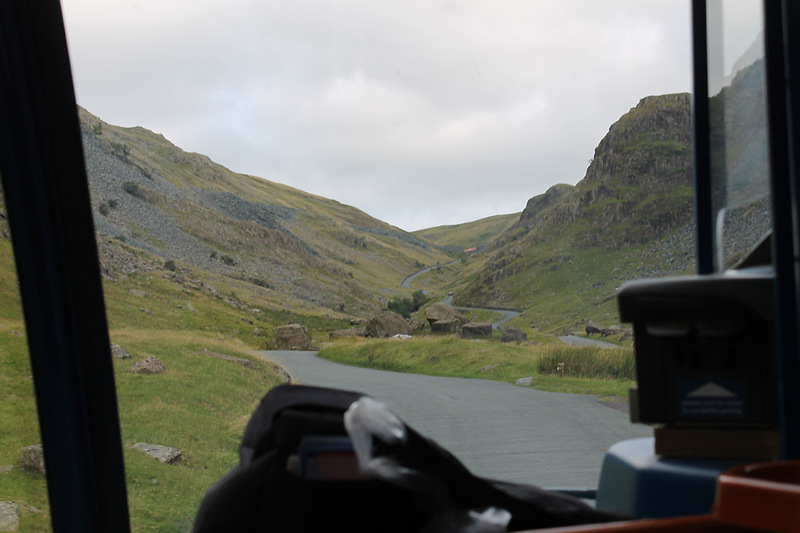 Outside we found the Honister Rambler almost ready to climb the pass on its last journey of the day. I climbed aboard for the journey back up the valley. Now Cathy could join the others and relax in the pub. Please feel free to join me ... borrow the ticket opposite ... it's virtual anyway so you'll not get into trouble ! No we weren't being overtaken . 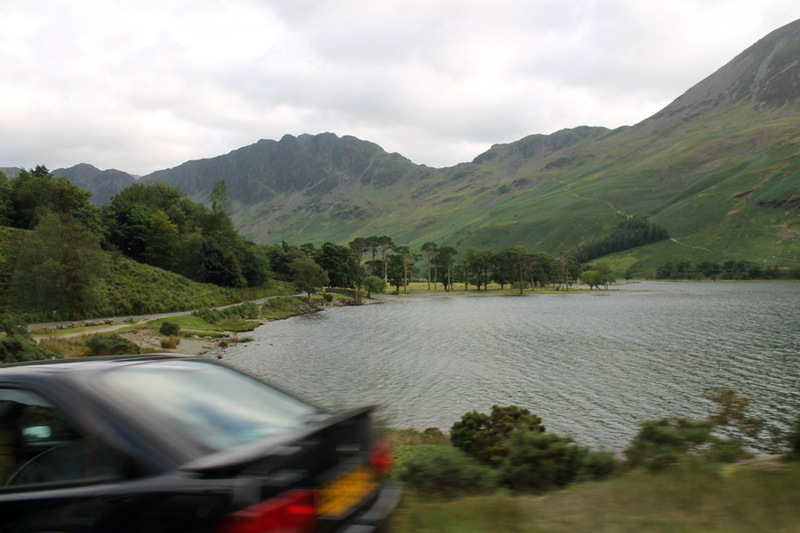 . . the bus was passing a parked car at the head of Buttermere Lake. 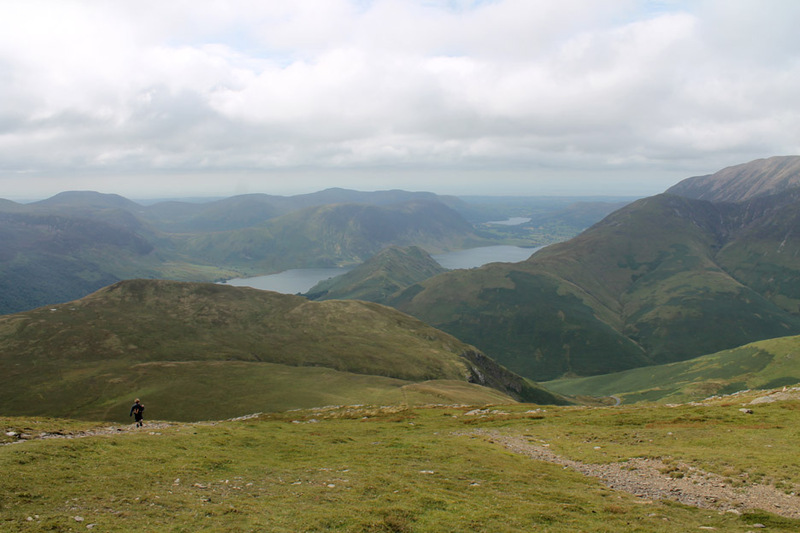 and coped a lot better than many of our Lakeland visitors with the narrow roads and steep hills. Problem solved . . . in the most delightful of ways. 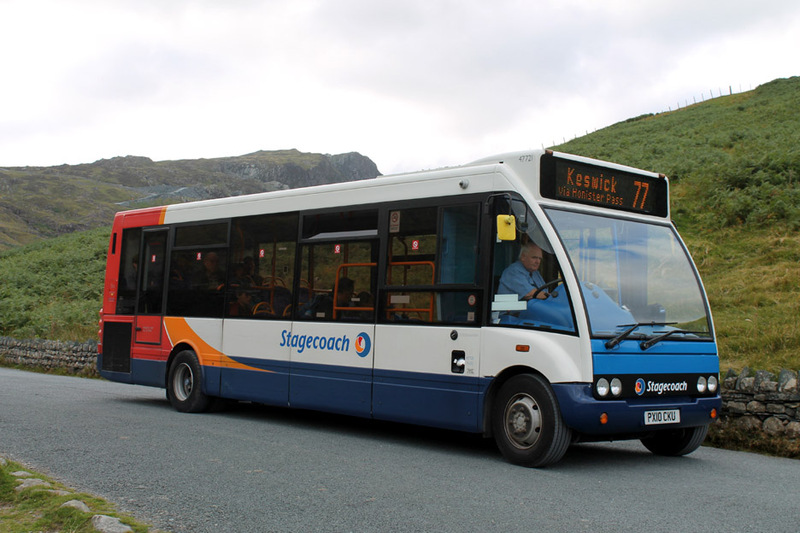 Thanks to the bus I'm back at the top of Honister . . . a prompt drive back down and I may well be in time for a swift half ! Click to start the short video . . . and then sit back and enjoy the ride. In the evening it was time to get spruced up for a visit to our favourite Cockermouth restaurant. Pre-diner drinks at Quince and Medlar . . . photo courtesy of the Canon self timer. 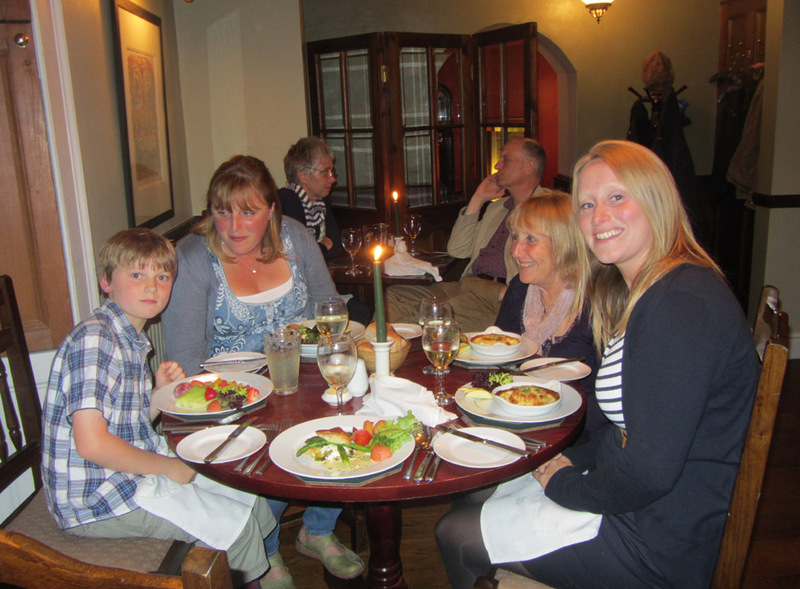 Fine vegetarian dining is the best way to describe the food and service on offer. Beautifully cooked by Colin and delightfully served by Louise. This site best viewed with . 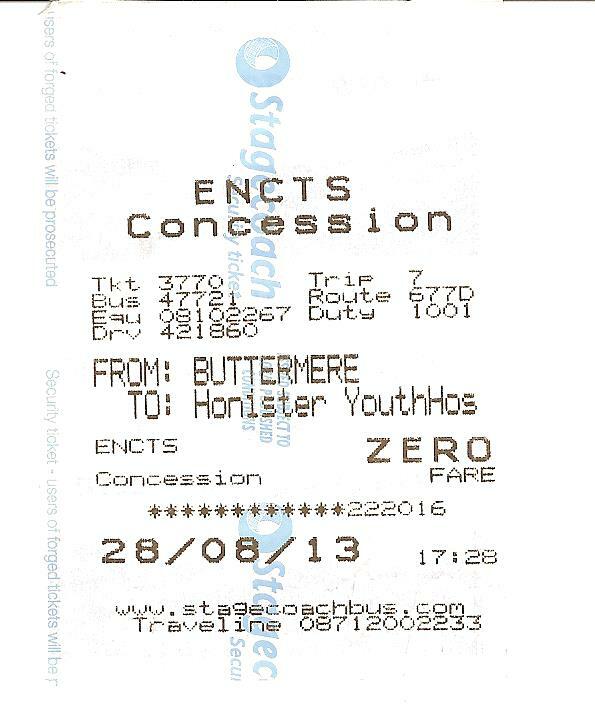 . . a bus pass and a smarter shirt for the evening !